Summer Homes Firefighters light a back fire on Monday, July 2nd near the summer homes hoping it will connect with the advancing fire front and create a fireline to stop the fire. Photo by Valerie Blair. 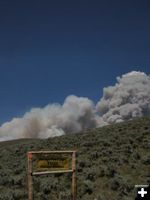 The Fontenelle Fire is burning in the Wyoming Range on the Bridger-Teton National Forest. It started on Sunday, June 24th, cause unknown. It is burning in heavy dead and down timber, under very dry weather conditions. It grew to 450 acres on Monday, moving generally in a northeasterly direction. 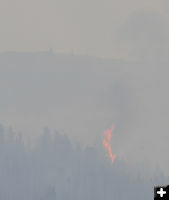 By Tuesday morning, June 26th, it more than tripled in size to 2,000 acres. By Wednesday morning, it had blown to 12,000 acres. Each day during the week it has grown by 4,000 to 8,000 acres. By Saturday it was over 45,000 acres. By Tuesday it was 56,179 acres and moved into North Piney Creek. We welcome photos anyone would like to share of the fire. Please respect all road closures and do not get in the way of firefigting vehicles and equipment, or put yourself in danger in any way if you go out to take pictures of this fire. Please send pictures to support@pinedaleonline.com and let us know a caption saying where & when it was taken, what is in the picture, and who to name for photo credit. Thank you to everyone who has shared their photos! NASA satelllite view July 5th View of the Fontenelle Fire from a NASA satellite on Thursday, July 5th. NASA satellite view View of the fire from a NASA satellite on Wednesday, July 4th. This is a false-color image. Protection at Sacajawea Campground Photo by USFWS. Middle Piney Summer Homes Middle Piney Summer Homes Photo by USFWS. Wyoming Fires View of Wyoming fires from a NASA satellite on July 4th. Wilderness smoke Tim & Sarah Schwarz had about 4-5 hours of HEAVY smoke/ash on Sunday up above Crescent Lake at the head of the Roaring Fork out of Green River Lakes in the Wind River Mountains. In the background is the east side of Osborne Mountain. This image was taken about five in the evening. Photo by Tim & Sarah Schwarz, taken Sunday, July 1st. Continenetal Divide Tim & Sarah Schwarz were on the Continental Divide, Continental Glacier, when the fire cloud of smoke headed in on Sunday, July 1st. "If the winds are just right, the mountains are tough to be in if you need to breath well!" Backfire Firefighters set a back burn to try and create black line to stop the approaching wild fire. Their efforts were successful and saved the Middle Piney Summer Homes. Photo by Valerie Blair. NASA view - July 1st View of Fontenelle Fire from a NASA satellite on July 1st. Middle Piney torching Trees torch on the south side of Middle Piney Creek on Sunday, July 1st. The trees are 30-40 feet high and the flames tower above them. The fire has spotted onto the North side of Middle Piney Rd. just west of Joe Budd Ranch. Engines and aircraft responded. 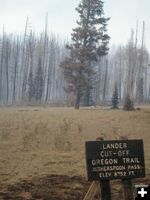 The Middle Piney road had been open to the public until today, but non-firefighting personnel were evacuated from the drainage when the fire exhibited extreme behavior. Photo by Great Basin IMT Team 5. Middle Piney blow up Tyler Foster took this picture Sunday afternoon, July 1st, while watching the fire in the Middle Piney drainage (the road was still open at the time). The fire blew up and sent flames high into the air. Soon after he took this picture, he was ordered out of the area. The fire spotted to the west of him on the Middle Piney Road. Torching trees On Sunday, July 1st, the fire spotted onto the North side of Middle Piney Rd. just west of Joe Budd Ranch. Engines and aircraft responded. Photo by Tyler Foster. Tall flames Sunday, July 1st in the Middle Piney drainage. The fire is moving towards the road. Photo by Tyler Foster. Denbury drill rig The Denbury (formerly Cimerex) methane-helium plant on Riley Ridge is still intact. The fire is working its way past to the west. Rumors that this plant has been consumed by the fire are incorrect. The plant is still intact. Operations have been shut down and workers have been replaced by firefighting personnel stationed to protect the structure, if needed.Photo taken Sunday, July 1st. Photo by Great Basin IMT Team 5. Denbury electrical Intense heat from the fire can distort viewing from a distance and heat waves can make it appear like trees and equipment are waving and bending back and forth. This photo was taken Sunday, July 1st. Photo by Great Basin IMT Team 5. Denbury Helium plant Photo taken Sunday, July 1st. Photo by Great Basin IMT Team 5. View from Denbury Looking into South Piney Creek drainage from the Denbury plant on the east side of Riley Ridge. All equipment at this site is intact and not harmed by the fire as of the time this photo was taken. The wells and facility have been shut down and evactuated. Photo taken Sunday, July 1st. Photo by Great Basin IMT Team 5. Protecting Summer Home Photo taken Saturday, June 30th. Photo by Jason Curry, Great Basin IMT Team 5 Information Officer. Middle Piney Lake Photo taken Saturday, June 30th. Photo by Jason Curry, Great Basin IMT Team 5 Information Officer. Campground work Crews are working to clear fuels from the campground areas before the fire gets there. Photo taken Saturday, June 30th. Photo by Jason Curry, Great Basin IMT Team 5 Information Officer. Big Piney water towers Photo by Kyle Ford. Smoke over Big Piney Photo by Kyle Ford. Fire sunset Photo by Kyle Ford. Smoky Big Piney Photo by Kyle Ford. View from Grey's River Looking South East from Grey's River just 1/4 mile South of Crow Creek on Thursday, June 28th. (Box Canyon Creek Runs just below rock face in lower right corner of picture). Looked like fire was coming from Middle Piney Lake. Photo taken Thursday morning, June 28th. Photo by Ken Tanner. West side fire view Looking South East from Grey's River 1/4 Mile West of Little Grey's River on 6/28 4:20pm. Fire appear to have moved significantly north to well past Coal Mine Mountain. Photo taken Thursday morning, June 28th. Photo by Ken Tanner. Blow up and helicopter Middle Piney Creek on Saturday, June 30th. Photo by Tyler Foster. 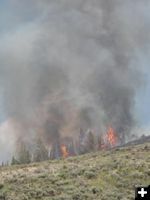 Fire and helo Middle Piney Creek near Joe Budd�s Place on Saturday, June 30th. Photo by Tyler Foster. Starting the water drop Middle Piney Creek near Joe Budd�s Place on Saturday, June 30th. Photo by Tyler Foster. Flare up Middle Piney Creek near Joe Budd�s Place on Saturday, June 30th. Photo by Tyler Foster. Middle Piney From the Middle Piney Road on Thursday, June 28, at approximately 7 pm. Photo by Karen Forrester. Thick smoke From the Middle Piney Road on Thursday, June 28, at approximately 7 pm. Photo by Karen Forrester. Cattle on the horizon From the Middle Piney Road on Thursday, June 28, at approximately 7 pm. Photo by Karen Forrester. Orange glow From the Middle Piney Road on Thursday, June 28, at approximately 7 pm. Photo by Karen Forrester. Moving to Middle Piney From the Middle Piney Road on Thursday, June 28, at approximately 7 pm. Photo by Karen Forrester. Moving into Middle Piney From the Middle Piney Road on Thursday, June 28, at approximately 7 pm. Photo by Karen Forrester. Hot fuel At the helibase, Friday, June 29th. Photo by Tyler Foster. Leaving the helibase Leaving the helibase, Friday, June 29th. Photo by Tyler Foster. Smoke from Big Piney Tuesday, June 26th. Photo by Tyler Foster. Smoke Smoke on Tuesday 6/26/12. Photo by Tyler Foster. Helicopter Tuesday, June 26th at the helibase. Photo by Tyler Foster. At the helibase At the helibase, Tuesday, June 26th. Photo by Tyler Foster. South side of the fire Fontenelle Fire 144 & 207 - Taken on the south side of the fire just off Hwy 235 at 3:30 pm on Thursday, June 28. Photo by Ben Bannister, Kemmerer. View from Alco Fire plume as seen from Bargerville from the Alco store parking lot. /26/12 taken on Tuesday, June 26th. Photo by Renee Ptreri. From Bargerville Monday, June 25th from Bargerville. Photo by Renee Ptreri. Flames in the distance Travis Thompson and his wife took a drive past Fremont Lake Thursday evening on their way back saw glowing orange spots in the distance in the Wyoming Range. This picture was taken a little after 9PM. 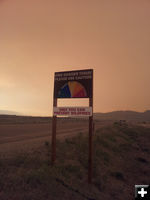 Distant fire dots Photo taken by Travis Thompson and his wife while on a drive Thursday evening near Fremont Lake. View looking towards the fire in the Wyoming Range. This picture was taken a little after 9PM. Time to change the sign Sign at Forest Service boundary to Bridger-Teton National Forest, Thursday, June 28, 2012. Photo by Duke Edwards. Night in the day in Pinedale Smoke from the Fontenelle fire darkens the sky over Pinedale on Thursday, June 28th. Out and away from the smoke path it was blue sky and sunshine Thursday. Photo taken around 4:15PM. Photo by Dawn Ballou, Pinedale Online! Thursday smoke in Pinedale Smoke from the fire made the sky so dark in Pinedale on Thursday afternoon, June 28th, the streetlights came on and people turned on their headlights. This photo was taken around 4:30PM (it gets dark around 9PM this time of year). Dawn Ballou, Pinedale Online photo. 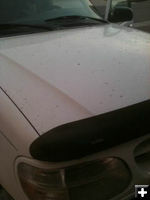 Thursday ash fall Ash on truck in Pinedale, Thursday afternoon, June 28, 2012. Photo by Renee Ptreri. Ash in Pinedale Ash on truck in Pinedale, Thursday, June 28, 2012. Photo by Renee Ptreri. Wednesday in town View from Pinedale Dental on Wednesday afternoon, June 27th. Photo by Linda DelRio. Starlight Smoke Plume Dave Bell took this photo on Wednesday, June 27th from the front yard at the Cross Lazy Two (Thompson ranch west of Big Piney). Click here for more of his fire pictures. View from spike camp Photo by Brandon Hampton. Torching trees on hillside Photo by Brandon Hampton. Lander Trail - Witherspoon Pass The fire is burning across where the Lander Trail, part of the Oregon Trail, crosses the Wyoming Range. Photo by Brandon Hampton. High fire danger Photo by Brandon Hampton. Riley Ridge Smoke This image was taken Wednesday evening, June 27th. The picture was taken from Trail Ridge showing smoke from Riley Ridge (on the right) and Trail Ridge (on the left). Photo by Kailey Barlow. Early Stages of the Fontenelle Fire This image was taken on Monday, June 25th when the fire was reported to be 100 acres in size. The picture was taken from Riley Ridge. Snider Basin is in the foreground of the photo. Photo by Kailey Barlow. Extreme fire behavior Dave Bell took this photo on Wednesday, June 27th from the front yard at the Cross Lazy Two (Thompson ranch west of Big Piney). Click here for more of his fire pictures. Pinedale view - June 27 Pinedale view on Wednesday, June 27th. View looking south over Pinedale from Orcutt Hill around 4:00PM on Wednesday, June 27. Mount Airy is where the smoke and blue sky meet. Photo by Bob Rule, KPIN 101.1 FM Radio. View from Upper Green This photo was taken by Jeannie Withrow about 4:00 pm Wednesday, June 27th about 1 mile north of Warren Bridge. View from Upper Hoback Rd June 27 View of fire smoke from Hwy189 at Upper Hoback Road turnoff on Wednesday, June 27th. Photo by Joe Zuback. Orange sky and sun Orange sky and sun looking towards Cora on Tuesday, June 26th. Photo by Tara Barnes. Owl Owl on side of County Road #144 with yellow/orange sky from fire on Tuesday, June 26th. Photo by Tara Barnes. Smoky Cora Smoke on the hills in Cora headed towards New Fork Lake on Tuesday, June 26th. Photo by Tara Barnes. Smoky sky from New Fork Looking back south from New Fork Lake on Tuesday, June 26th. Photo by Tara Barnes. Upper Hoback View of fire smoke from Hwy189 at Upper Hoback Road turnoff on Wednesday, June 27th. Photo by Joe Zuback. Near 189 and 191 View of the smoke on Tuesday, June 26th as seen from north of Daniel on Hwy 189. Photo by Joe Zuback. 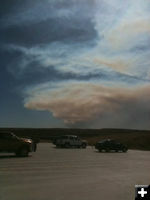 From 189 The smoke plume as seen from US 189 north of Daniel on Tuesday, June 26th. Photo by Joe Zuback. Half brown half blue View on Tuesday showing how the smoke plume darkened the sky on what was a beautiful summer day. Photo by Joe Zuback. Towards Snider Basin Photo taken from Deadline lookout facing west towards Snider Basin. Picture taken Tuesday, June 26. Photo by Jason Essington. Looking toward Packsaddle Ridge Photo taken from Deadline Ridge looking northwest to Packsaddle Ridge. Picture taken Tuesday, June 26. Photo by Jason Essington. Looking northwest at fire Photo taken from Deadline Ridge looking northwest to Packsaddle Ridge. Picture taken Tuesday, June 26. Photo by Jason Essington. View from Deadline Ridge Photo taken from Deadline Ridge looking northwest to Packsaddle Ridge. Picture taken Tuesday, June 26. Photo by Jason Essington. S Piney Road view Fontenelle Fire from South Piney Road on Tuesday, June 26th. U.S. Forest Service photo. June 26, 2012 Photo taken on Tuesday, June 26th. Photo courtesy US Forest Service. Tuesday, June 26 Photo taken on Tuesday, June 26th. Photo courtesy US Forest Service. LaBarge Creek Photo by Nicole Hallisey. View from Daniel Junction Fontenelle fire smoke as seen from Daniel Junction on Tuesday, June 26. Photo by Joe Zuback. Smoke plume Fontenelle fire smoke as seen from Daniel Junction on Tuesday, June 26. Te smoke column missed Daniel and the brunt hit Pinedale. Photo by Joe Zuback. Downtown Pinedale View of main street of Pinedale Tuesday afternoon, June 26th. Photo by Dawn Ballou, Pinedale Online! Smoky Pinedale View of Pinedale on Tuesday, June 26th, as smoke descends on the town. View looking south from Orcutt Hill. Photo by Pinedale Online! Oh No It's Started The Fontenelle fire has lofted massive smoky clouds over Pinedale. Even though the fire is located roughly 35 miles away, we are smack dab in its plume as of Tuesday afternoon (June 26th). The day is a bluebird day with no clouds and bright sunlight, but light ash and twilight are the highlights of the afternoon. Photo by Dave Bell. Fontenelle Fire Sunset Dave Schultz took this sunset picture Sunday night from Pole Creek Road south of Pinedale. "The smoke and clouds made for a good picture." Flames on the ridge Fire view from the air on Sunday, June 24, 2012, the day the fire started. US Forest Service courtesy photo. Fire June 24, 2012 Fire view from the air on Sunday, June 24, 2012, the day the fire started. US Forest Service courtesy photo.